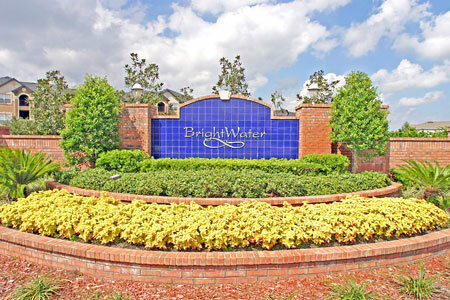 Brightwater townhomes in Jacksonville, Florida. Conveniently located in the Southside area, Brightwater is close to 9A, premier shopping and dining, the beach, office parks and schools. Each townhome features ceramic tile flooring, beveled edge kitchen countertops, volume ceilings, centralized wiring, and attached garages. This 224-residencial homes community offers a gated entry, fenced perimeter, pool, cabana, fitness center and maintenance-free landscaping. Brightwater offers three floor plans with one-car garages, two and three bedrooms, spacious owner's suites, walk-in closets, vaulted ceilings and state-of-the-art CAT5 and RG-6 wiring.